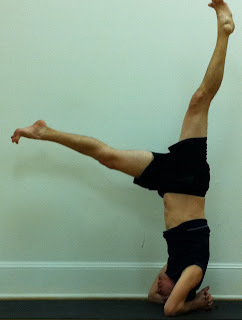 Headstand is one of the key, foundational poses of any good yoga practice. I remember like it was yesterday the earth-shattering moment when I finally got into my headstand without the use of the wall. It was not until many years later that I had an epiphany that would change the way I taught headstand forever. No More Walls! 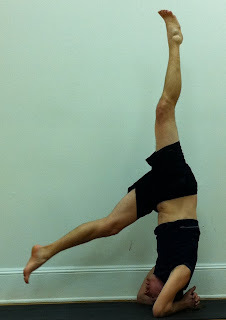 I was trained by some of the best teachers in the country on various methods, tips and adjustments for teaching headstand but all but a few utilized the wall and the ones that didn’t were not as safe as I would have liked. Then came the epiphany! Why spend months trying to wean frightened yogis and yoginis away from the wall? Why are they frightened? People are frightened of the unknown. Why are they unsure of their ability to do headstand. Because crutches make you weak. 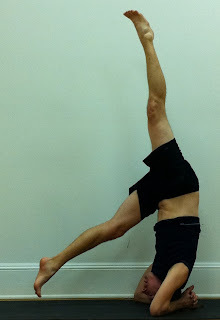 I saw that the headstand I had been taught was not about the work of strengthening the body as with poses like warrior but it had become a novelty for being upside down. So what is the work of headstand? I decided to approach this pose like a Tai Chi posture. The slow (really, really slow) movement between point A and point B is what creates the strength to make the movements of Tai Chi look effortless and graceful. So I removed the crutch (the wall). I also removed the urgency for the student to be upside down but rather made the goal a feeling of strength and an innate knowledge that he or she could absolutely do it. They could do it because the work they were doing had made them strong and they could feel their strength. The knowledge of your own strength eliminates fear. Assume the position. Specifically, dolphin pose. 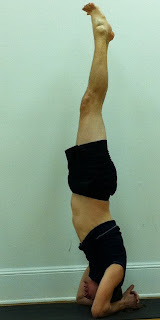 Now slowly lift one leg (straight leg not bent) toward the ceiling. Continue reaching as though you were trying to cause the other foot to come off of the floor. No kicking, hopping, jumping or swinging only slow methodical reaching. Now, change legs and do it on the other side because we want the muscles on both sides to be equally strong (even if you are absolutely certain that you will never begin your headstand with the other leg). notice this lady’s reaching leg is bent … I don’t like that! Continue to do this “Dolphin Reach” until the other foot does come off of the floor (don’t panic and do NOT lift this leg up to meet the other. Just maintain this “one leg reaching, one leg floating” position as long as you can … then change legs. It may not happen on the other side this first time. If it does then repeat the reaching-floating on each side. After a period of time (a day, a week, a month …) with continued practice with the reaching and floating you will feel strong enough to lift your foot higher. Again do not try to go all the way up to meet the other foot but merely float at about half-way. Again after a period of time you will feel strong enough to lift your foot higher, maybe even all of the way up. The important factor to keep in mind is that you will KNOW that you can do it because you will be able to feel the strength and capability. If there is still the slightest of doubts in your mind then you are not ready. Once there, you will revel in the exhilaration of feeling as though you are the king or queen of the world just remember not to relax until you have placed both feet on the floor gently and slowly. Now about that area between your head and your body; your neck. From beginning to end your neck must have a feeling as though you were standing on your tip-toes trying to look over a fence. This will keep the weight of your body in the muscles and away from the bones as we try to do in every yoga asana. Remember to consult your physician before beginning this or any other physical endeavor. Special thanks to Josh Bretherick (my #1 student) for wearing himself out posing for the photos! Copyright © 2019 Studio108 Yoga Centers All rights reserved.